It was late November when I heard a mewing sound from a tree in my back yard. I immediately thought catbird but it was too late in the year to expect a catbird in Indiana. Then I spotted the bird on the tree trunk, a Yellow-bellied Sapsucker (Sphyrapicus varius). I had never associated the sapsucker with a mewing sound but when checking the recordings on my bird app, I verified that the cat-like call I heard was indeed a sound the sapsucker makes. The Yellow-bellied Sapsucker is a migrant through northern Indiana and usually seen March to April and September to November. The sapsucker breeds in Canada and northern states such as Michigan and Wisconsin. Sometimes stragglers are seen in northern Indiana during Christmas bird counts. Like other woodpeckers, the Yellow-bellied Sapsucker is mostly black, white and red, but as its name indicates, its underside is yellowish in color. It is somewhat larger than a downy woodpecker. To distinguish the sapsucker from other woodpeckers, look for the long white stripe on the side of its wings. On the male the red throat is the most obvious distinguishing mark. Both sexes have red foreheads and a black shield on their chest. It is usually found climbing up, down, and around tree trunks. The name ‘sapsucker’ describes its feeding behavior. It drills a series of holes creating a ring into tree trunks and then feeds on the tree sap and any bugs that have been trapped in the sap. Sapsuckers choose tree species with high sugar concentrations in their sap, such as paper birch, yellow birch, sugar maple, red maple, and hickory. When sapsuckers drill too many holes in any one tree, they can girdle it, cutting off the flow of sap to the branches, possibly killing the tree. This is more of a problem in northern states, but when it happens in orchards and other trees important to humans, it can be a problem. Yellow-bellied Sapsuckers are cavity nesters. The male does most of the work excavating the cavity over about 2 to 3 weeks. No lining is placed within the nest; the eggs are laid on wood chips left over from the excavation. There are 4-6 eggs per clutch, and incubation lasts 10-13 days. Young fledge after 25-30 days. In addition to the mewing sound mentioned earlier, the sapsucker also has a squealing call, a repeated quee-ah, quee-ah, that’s territorial and they make a waa call when disturbed or to alert others to danger. Like other sapsuckers, the Yellow-bellied Sapsucker’s drumming is slower and more irregular than other woodpeckers. Its stuttering cadence can sound like somebody tapping out morse code. In addition to trees with good resonance, Yellow-bellied Sapsuckers also drum on metal surfaces — like street signs or chimney flashing — to amplify their territorial messages. The drumming is usually done by males during breeding season. Vultures are often described as Nature’s undertakers. No mess on the highway seems too repugnant for a vulture to dine on. Here in North America, vultures are represented by three species: the turkey vulture, the black vulture and the California condor. Genetic evidence places the vultures in close relation to the stork family although our intuition might have placed them closer to the hawks and eagles. Our common vulture in northern Indiana is the turkey vulture. Historically, the slightly smaller black vulture, Coragyps atratus, seldom ventured much farther north than the extreme southern part of the state along the Ohio River. The black vulture and the turkey vulture are easily differentiated. The turkey vulture’s head and neck are naked and red, whereas the black vulture’s head and neck are naked and black. Also, the black vulture has large whitish patches near the wing tips, a feature that is absent in the turkey vulture. The wing span is about four and a half feet. Black vultures do more wing flapping than turkey vultures. Black vultures make their nests on the ground. The usual clutch is one to three greenish colored eggs variously marked by purple splotches. The eggs require approximately six weeks to hatch. To conserve energy, black vultures lower their metabolic rate during the night. At dawn, they spread their wings toward the rising sun to absorb heat and regain their normal body temperatures. The original terrain of the black vulture was the southern United States from the east coast to the west as far as Texas. In Indiana, they were seldom seen north of the Ohio River. Formerly, the only location in Indiana where they could be found dependably was the Clifty Falls State Park area on the north bank of the Ohio River. With global warming now in progress, black vultures are being seen farther north including the Lake Monroe area and the area around Bloomington. In fact, they are becoming persona non grata. Some farmers have found that black vultures sometimes kill and devour newborn calves. Also, it seems that the birds have a well developed instinct to pick and peck at anything made of black rubber. Windshield wipers on automobiles or rubber seals around car windows are fair game. They have even ripped away rubber roofing seals on utility buildings. Like other birds, black vulture reproduction was severely compromised by the widespread use of DDT during the middle of the last century. Now that DDT is no longer in use, the black vulture has rebounded well. Federal law prohibits killing black vultures without a permit. The permit costs $50 and is not easy to obtain. If climate warming continues, we in our area will soon be able to add the black vulture to our northern lndiana birding lists. They will also help us keep our roads free of carrion. It is, perhaps, the only bird that any non-birding American can easily get excited about. Personally, I’ve always hoped to use a Bald Eagle (Haliaeetus leucocephalus) sighting to get someone excited about other birds. There’s currently no evidence that these efforts have been fruitful. More experienced birdwatchers are not, by any means, immune to the excitement of a Bald Eagle sighting. My most-memorable Bald Eagle sighting took place on a Christmas Bird Count a few years ago. Margit and I were trying to find openings between houses on Pike Lake where we could get a good view of a patch of open water. We managed to find a good spot for an unobstructed view of some open water and focused our ‘nocs in on a codgery of coots. I searched through the sea of black feathers hoping to find something else when something large flew through my binoculars’ field of view. I pulled my ‘nocs down and found a Bald Eagle perched off to the side watching over the fleet of coots. I spent several years living pretty close to the Wabash River and I feel somewhat spoiled to have had such regular Bald Eagle sightings. As part of my work duties, I’m often running into people on the trails and they commonly ask where Bald Eagles can be found. Based on my own experience, I just tell ’em to go to Speedway in Wabash because I always see one around that area. Now, I expect that folks don’t generally want to go to fueling stations in highly-developed areas to see wildlife, so then I suggest Salamonie State Park for a better experience. While a Golden Eagle (Aquila chrysaetos) sighting wouldn’t be impossible, Bald Eagles are much more common in our region. Due to the time it takes for Bald Eagles to develop their adult (breeding) plumage — about five years — I suspect many large immature Bald Eagles are misidentified as Golden Eagles. There are a few subtle differences that will aid the observer in the field. Fortunately, eagle sightings ought to allow such time for the observer to distinguish between these two eagle species, as sightings aren’t generally as fleeting as, say, a Winter Wren (Troglodytes hiemalis) sighting. I hope to check the ‘Bald Eagle’ box on this year’s Chistmas Bird Count — whether or not it is as exciting as the previously-mentioned experience. 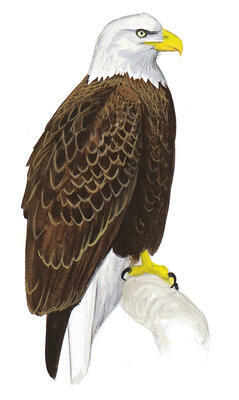 I hope that you, too, will be able to spot one this winter as Bald Eagle numbers in our region increase. Bald Eagles tend to become more common in our region during winter months as birds venture out from their northern territories in search of open water. Staff at our local reservoirs take advantage of these congregations and will promote events when the greatest number of eagles can be seen. Contact the interpretive centers to inquire about these events. You may not think the American White Pelican is an Indiana bird, but while it has not been found nesting here, it is possible to see them here, especially in spring, but also, infrequently, in the fall. Most published distribution maps exclude Indiana even from their migration routes, but a check of eBird sighting maps gives one the impression that these are birds that are likely to wander. Numbers of birds sighted in Indiana in the spring (March & April) have been steadily climbing, especially since 2005. In April 2014, 1,000 white pelicans were seen at Goose Pond Fish & Wildlife Area, which seems to have become a significant stopover area on the eastern fringes of the White Pelican migratory route. They have been seen in migration from the longshore tower at Indiana Dunes State Park, at Willow Slough Fish & Wildlife Area, at Potato Creek State Park, and even as close as Lake Manitou, at Rochester. One of the largest of North American birds, standing 4 feet tall and with a 9-foot wingspan, they are much larger than brown pelicans. They are, in fact, among the heaviest flying birds in the world at 16 pounds, but are world-class soaring birds and spectacular fliers, with flocks often soaring very high in the air, advancing in formation, or wheeling and circling in unison. Adults are white, with black flight feathers that can only be seen when they are in flight. Bills and legs are yellow-orange, paler on immatures and non-breeding adults. Immature birds are mostly white, but head, neck and back are dusky. While brown pelicans spectacularly plunge-dive to catch fish, white pelicans scoop fish only from the water’s surface, often upending like a dabbling duck. American White Pelicans feed in shallow lakes, rivers, and marshes. Often hunting for food in groups using synchronized bill dipping, they will form a line and start swimming towards shore while flapping their wings and herding their prey towards the shore. Adults eat up to three pounds of fish per day, primarily rough fish of little value to humans. They also eat salamanders and crayfish. 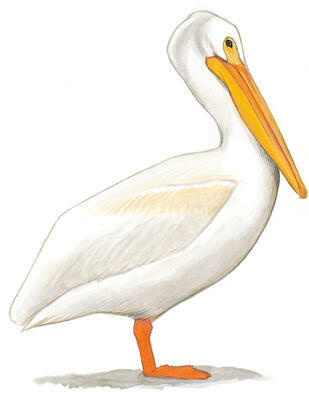 Breeding mostly in south-central Canada (Manitoba, Saskatchewan, Alberta), as well as Minnesota, the Dakotas, and Montana, and a few disjunct more westerly breeding areas, American White Pelicans typically breed on isolated islands in freshwater lakes, or on ephemeral islands in shallow wetlands. They breed in colonies, and there are fewer than 60 of these colonies in total, making them vulnerable to predation and habitat loss. They are easily disturbed during nesting, often abandoning nests if disturbed. The female lays 1-3 white eggs in a depression on the ground or on a mound of vegetation and dirt, made only with materials from the immediate vicinity of the nest. Both parents incubate the eggs, but as incubation patches are absent, both sexes incubate by holding eggs under large foot webs. Eggs hatch in about a month. If the female lays more than one egg, usually only the strongest chick will survive. Chicks are born naked, but within a week they are covered with white down. Chicks leave the nest and join a pod of young pelicans when they are 17-28 days old. Chicks fledge when they are about 10 weeks old. Adults are usually silent, except for frequent low, brief grunts at the colony site. Young are more vocal; loud begging calls by hundreds of older young at a colony can produce a large volume of sound. White pelicans spend winters mainly on coastal waters along the Gulf of Mexico, from Florida to Mexico, and also along the Pacific Coast. During winter, they can be found in shallow, protected bays and estuaries, as well as a little distance inland, and also on large lakes in warm climates. Most populations are migratory. Some populations on the Texas coast and in Mexico are permanent residents, and some nonbreeding birds remain through summer on their winter range, especially in Florida. They migrate by day, generally in large flocks, stopping on lakes, and rivers to rest and feed. Populations breeding east of the Rocky Mountains migrate primarily southward and eastward towards the coast of the Gulf of Mexico. Populations breeding west of the Rocky Mountains move primarily southward to California and the west coast of Mexico, rarely eastward. Of course, these generalizations have their rare exceptions, with some groups actually crossing the continental divide to winter mostly along the Pacific rather than Atlantic coastline. Other than their great size, tremendous soaring ability, and a bill that becomes a huge scoop while fishing, white pelicans have another unusual feature. When breeding, adults — both male and female — grow an odd laterally flattened plate or bump on the top of the bill. This hard bump falls off after breeding. Although not one of our most common birds, Scarlet Tanagers (Piranga olivacea), specially the males in breeding plumage, are one of the easiest to identify. They are cardinal-sized, and their bright red coloration with jet-black wings and tail is unique. However, they are often not so easy to actually get a glimpse of, as they spend much of their time among the leaves of the treetops. Females also have an interesting color pattern, but one that makes them even harder to spot. The red and black of the male are replaced by yellowish green and dark gray. During the non-breeding season male Scarlet Tanagers develop a female-like greenish plumage, although retaining the black wings and tail. Vocally, Scarlet Tanagers sound rather like American Robins with a sore throat. They also have a very distinctive chick-burrr call (You can hear sound files at http://bit.ly/14gxoGx). The female’s song is like that of the male, but less harsh in texture. Male birds usually sing to defend their territories against other males of their own species. Where Scarlet and Summer Tanagers both occur, males will defend territories against the other species as well as their own. Scarlet Tanagers typically nest in the interior of mature deciduous forests, so they are tied to relatively undisturbed habitats. They usually do not breed in forest areas of less than 25 acres. In smaller forest patches they are strongly affected by nest parasites and predators such as cowbirds and raccoons, reducing their reproductive success. They can be found well up into Canada in the breeding season, but their greatest abundance is in forests of the central Appalachians from Pennsylvania to Virginia, although they also breed in the Midwest. In the TAS May count, Scarlet Tanagers have been seen every year but one since the start of the count in 1976. However, it is rare for more than 20 individuals to be seen during our count. Nests are oval to round and are fairly neatly built of twigs and grass. They are located on horizontal tree branches, high up and away from the trunk. A clutch usually consists of four greenish or bluish eggs with brown to purple spots. They are incubated for about two weeks, and the young fledge about 10 days after hatching. Although Scarlet Tanagers breed in Indiana and count as one of “our” bird species, they are Neotropical migrants. They move out of our area in the winter and spend their time in Central America and the eastern Andean foothills from Panama to Bolivia. There they join the mixed-species flocks that are typical of the tropics, and consort with a variety of tropical birds including other tanagers. Even on their wintering grounds, they tend to prefer well-developed forests. Scarlet Tanagers have fairly large beaks that are suited for eating a range of food items. Like a number of local bird species, they switch from an insect-based diet in the breeding season to feeding mostly on fruit in the migratory and overwintering periods. During the summer, they feed primarily in the forest canopy. As well as catching insects on branches and twigs, they hawk (chase and capture flying insects). Males and females differ somewhat in their feeding methods, with females foraging higher in the canopy and hawking more often than males. Although they require the interior of mature forest areas for breeding, Scarlet Tanagers seem to be holding their own in population size. The Partners in Flight organization estimates a total population size of about 2.2 million, with almost all of the breeding population in the US. Breeding Bird Surveys, organized by the US Fish and Wildlife Service since 1966, indicate that US populations have been rather stable since the 1980s. In the Great Lakes region, populations have been on the rise, which compensates for losses in Canada and the northeastern US. However, deforestation in the US and the tropics constitutes a potential threat to the species. Scarlet Tanagers belong to the genus Piranga, of which there are four other species found in the US. The only one that occurs regularly in Indiana (mostly in the southern part of the state) is the Summer Tanager, in which the black and gray areas of the Scarlet Tanager are replaced by dark red in the male and light gray in the female. The colorful Western Tanager occurs from the Great Plains to southern Alaska. Two more species, the Flame-Colored and the Hepatic Tanager, occur only in the Southwest. Tanagers are now considered to be members of the Cardinalidae, the Cardinal Family. They were formerly classified in the large family Thraupidae, the Tanager family, which includes many colorful birds in Central and South America. However, recent DNA studies have shown that this family needs to be reclassified, and some birds previously in the Thraupidae have been moved to the Finch and Cardinal Families. The Acadian Flycatcher (Empidonax virescens) is not easily distinguished from its flycatcher relatives by sight. In fact, 15 species of this family (Tyrannidae) were thought to have been the same species when the first member of this species was discovered in present-day Nova Scotia.2 It was not until years later when ornithologists were able to identify different species within this group based on their range and song. The song may also be easily lost in the early spring chorus as it is a simple two-note “peet-sah”. Oddly enough, the Acadian Flycatcher kept the original name given to this group — although its range did not extend to the Northeast coast of North America.2 The northernmost summer range of the Acadian Flycatcher extends to Massachusetts and the southern reaches of Michigan and Wisconsin. Perhaps the Least Flycatcher or Willow Flycatcher would have been the species who were mistaken with the Acadian Flycatcher, as the former two species’ ranges extend to Nova Scotia. Collective nouns include an “outfield”, a “swatting”, a “zapper” and a “zipper” of flycatchers. The American Kestrel (Falco sparverius) is North America’s smallest falcon. They are most often seen on utility wires along roadsides, and a drive along a northern Indiana country road is likely to chase a kestrel or two off a utility wire. Their favored habitat is open country with short vegetation and few trees. They may also be seen hovering in place over open fields. Northern Indiana’s pastures, hay fields, and some farm fields furnish good kestrel habitat. They will use trees, especially dead ones, if those trees are in open areas, or at the edge of woods. In fact, kestrels generally nest in tree cavities. Since they cannot excavate their own cavities, they rely on old woodpecker holes or natural tree hollows, as well as rock crevices, and nooks in buildings and other human-built structures. They also take readily to nest boxes. Kestrels primarily eat insects and other invertebrates when these are available, and otherwise (as in winter in Indiana) will eat small rodents, like voles, mice, and shrews, and even small birds. They generally catch prey on the ground, though they will capture some insects in flight. Unlike humans, birds can see ultraviolet light. This enables kestrels to make out the trails of urine that small rodents leave as they run along the ground. Like neon diner signs, these bright paths may highlight the way to a meal—as has been observed in the Eurasian Kestrel, a close relative. Kestrels have a huge range, nesting from the Arctic to Central America, and the east coast to the west across the U.S. and southern Canada. In winter, kestrels vacate all of Alaska and Canada, the northern plains states and New England. It is possible to find them in the hundreds at coastal migration sites—such as Cape May, New Jersey, or Kiptopeke, Virginia—in September or early October. Their conservation status is currently of `Least Concern.’ However, recent counts and breeding bird survey data have indicated declines in some areas—such as in New England, parts of the Pacific Coast, and Florida, where the state lists it as a threatened species. Habitat loss may be a factor in their declines, especially through felling of the standing dead trees these birds depend on for their nest sites. The American Kestrel is also losing prey sources and nesting cavities to so-called “clean” farming practices, which remove hedgerows, trees, and brush. An additional threat is exposure to pesticides and other pollutants, which can reduce clutch sizes and hatching success. For kestrels in North America, a larger problem with pesticides is that they do their job, destroying the insects, spiders, and other prey on which the birds depend. Have You Looked for Gold? When Russel Mumford compiled the list of Birds and History of Jasper Pulaski FWA starting in 1929, some big changes emerged when compared to the present time1. The park was changed to promote waterfowl and their most famous visitors Sandhill Cranes, another wonderful bird found here was the Golden-winged Warbler. Data shows2 Porter County had the most sightings of the Golden-winged warblers in summer and probably nesting with six in 29 years. This area in Dunes State Park recently recorded a hybrid. Jasper Pulaski FWA is a close second with two territorial males in 1984 and two in 1986 and one in 1997. Hybrids found there were a “brewsters” in 1994 and one unidentified singing a Golden-winged song in 2004. Other counties reported a few for a year or two. Amos Butler called them fairly common and summer residents in the upper third of Indiana. He even mentioned their decline as do many books today. His book was published in 1898 when extensive prairies and swamps remained. Golden-winged Warblers are a jewel of a bird. Black marks on head, yellow crown and yellow wing patch, rest of wings look silvery. Female is a faded version of the male. Song sounds like bee-bz-bz-bz. Hybrids have more yellow belly like a Blue-winged Warbler. This bird you would think would be more common because overgrown grasslands often exist without them. Some are still found in Appalachian Mountains, some in Ontario, Minnesota, Wisconsin, Michigan and New York. Northern Indiana is about their Midwest limit to their range. They live in grassy areas with tree borders. Goldenrod is a key plant — along with briars and very small trees. They nest on the ground in the grass where four to five eggs are laid. They eat small insects and larvae. Burning can maintain their changing habitat. If trees get too big, they leave and Blue-winged Warblers take over which can live in open woods. Golden-winged warblers are “habitat specialists”2 while Blue-winged Warblers are “habitat generalists”. Here are a few conclusions from the Confer and Knapp study cited: only abandoned farm land produces suitable habitat and that trend is revered today or woods have taken over, They compared Kirtland’s warbler with their enemy the Cowbird controlled. Blue-winged Warblers may need to be collected in some areas and moved to protect a key nesting area. Like our friend the Bobwhite quail, they say Golden-winged Warblers are “highly influenced by man’s activities”. A few effective management techniques may help save these beautiful warblers. If you wanted to add Whippoorwills to your morning observations of birds, you would have to get up early. In the old days, bird watching groups would find Greater Prairie-Chickens (Tympanuchus cupido) early in the morning at their “booming grounds” late in February, March and April. They would visit a farm near Jasper-Pulaski Fish and Wildlife Area where state road 49 abruptly ends. Another site was on highway 14, 5½ miles west of the Jasper-Pulaski county line. Later, up until the demise of the Indiana Prairie-Chickens in 1973, Newton County was the only place in the state to find them. These game birds were well studied over the years. A yearly survey of known booming grounds was conducted from 1942 to 1974. The 1951 survey found 17 Prairie-Chicken booming grounds in Newton County, six in Jasper County and one in White County. Six flocks were found at Fair Oaks Farm in Newton County, where they lived with cattle in over 100 acres of pasture. Since 1850, native prairie habitat has been plowed and settled. At first, Prairie-Chickens and humans maintained a balanced coexistence. Man offered corn and soybeans to supplement the Prairie-Chicken’s diet of native seeds and Prairie-Chickens were a food source for humans. Unlike Ruffed Grouse that hate open country, Prairie-Chickens have few enemies and will readily display and feed in the open. Great-Horned Owls are one of a few predators that are a danger to Prairie-Chickens, so thick stands of big bluestem tallgrass were needed to roost and nurture their young. Today, these birds are found in areas of Illinois, Minnesota, Wisconsin, and many scattered areas west of the Mississippi River. They have also been found in the southern portions of Canadian provinces Alberta, Saskatchewan and Manitoba; and less commonly in southern Ontario. A bird guide will show the subtle characteristics for identifying females and the more easily identifiable males. The male’s “booming” sounds like oo—loo—woo, an unmistakable low-frequency sound. At a distance, a group calling all at once sounds like chaotic howling. The display, shown in the above photo, establishes a pecking order; they stomp their feet, bow, jump and yelp. The females enter in lesser numbers and eventually mate once with a dominant male. This single copulation fertilizes an entire clutch of 10-18 eggs. Much has been written about how abundant Prairie-Chickens were in Indiana. A study in 1910 by Commissioner Miles of the Indiana Department of Conservation reported 100,000 individuals. By 1951, only 650 were reported. Russell Mumford found the last reported nest in Indiana on June 13, 1964 and the last brood in 1970. Indiana Department of Natural Resources Biologist, Robert D. Feldt witnessed the last Indiana Prairie-Chicken on April 3, 1972 in Newton County. Sadly, it was booming to an untenanted audience. What happened? Why was nothing done to preserve them? Simply put, the Prairie-Chickens were caught in a land squeeze. The average size of an Indiana farm in the 1900s was 100 acres. After World War I, grain prices dropped and stayed low. Expenses of modern farming — seed, fertilizer, equipment and taxes — required more land in production to retain profit margins. So, the response was to plow every bit of the back forty in order to maximize profits. The beginning of World War II brought with it an increasing number of factory jobs, which allowed some less-profitable farmers to sell their land to farmers with a greater amount of production. The land squeeze was affecting farmers and our birds. Guess which was squeezed the tightest? By the 1960s and 1970s capital grew so much that this scenario was inexcusable. People had new wealth to buy land in the country and it only took one square mile of tallgrass prairie to support a local population of Prairie-Chickens. Organizations, the government and private landowners could have acted to save the Prairie-Chicken, but no one did. The pitfall of the Beaver Lake Prairie-Chicken Refuge in Newton County is that it lacks suitable cover to protect them. Efforts at the Kankakee Sands are ongoing to restore prairie habitat on 7,000 acres but it will require years to grow into true habitat. Also, Universal Mine in southern Indiana is good prairie habitat and many are hopeful that someday Illinois birds may be successfully introduced to restore the Prairie-Chicken population in Indiana. The tallgrass prairie once covered one-third of our state, yet is now endangered like no other habitat. This threatened ecosystem provides habitat for many species that are likewise becoming threatened with extinction. The land that was once native prairie requires our immediate critical attention to protect the small fragments that still remain and to restore other areas to their former splendor.